Russian culture and masterpiece monuments attract many tourists. Moreover, Many visit the Russian capital and enjoy the Russian atmosphere. There are many things you can do in Moscow. You can sightsee though outstanding famous places in Moscow, from the majestic St. Basil’s Cathedral, the famous Kremlin to the busy and crowded Red Square. Moscow holds many interesting places that are the Russian icons, include the famous Red Square and famous landmark around it. Or you can enjoy the fashionable Moscow street style and roaming the cities street that often reaches below 0 degrees but that did not stop Russian to stay fashionable. They have their own fashion rules for living in Russian weather. Another Russian icon is their metro system. It is the most advanced and organized in the country. in addition, The even small city has quite organized and beautiful metro stations. Russian metro stations are not your typical stop place to get on and off trains. Therefore, Russian really have highlighted their metro stations into a famous icon for tourist. The Moscow metro stations system is one of the best means of transportation in Russia. It is extremely fast and a good way to travel to get from A to B. They accommodate Russian and traveler for roaming the city. However, the highlight of their existence is their beautiful features. You don’t see these beautiful design in any other metro stations in the world. Moscow metro stations have been around for centuries. each metro stations describe the different story and various background. Moreover, it symbolizes Russian history decorates among their walls and majestic ceilings. Breathtaking history if Moscow metro stations. Moscow metro stations icon portray classical feature. it is full of mosaic decorations, hanging chandeliers, paintings, and impressive statues. Moreover, you can dine like a tsar and travel the city like one too. You can’t help feeling like royalty when you set foot here. It also serves as a museum that describes Russian history. The first metro station was on 15 May 1935, it was subterranean of the communist paradise. The engineers choose the metro stations locations carefully to reach people and get them to the important part of the city. the entire classical decoration such as marble walls, high ceilings, stained glass, mosaics, and chandeliers are part of Joseph Stalin and communist believes. However, their engineers are nor Russian but from the British. The Russian makes metro as a rival to metros in London. Russian history describes many of their iconic places inspired with the world. The Russian is more than happy to ride the first metro on the day it opened. Its construction describes the technological and ideological for socialism and Stalinism. You can see a huge portrait of Vladimir Lenin at one of the first Moscow metro stations – Biblioteka Imeni Lenina. Stalin communist value includes construction on various lavish palaces around Russia, this also involved metro stations. Dvorets Sovetov is another grand exhibit of place in transportation media. Stalin first demolished Cathedral of Christ the Saviour and built the Dvrets Sovetov with the marble from the cathedral. However the costruction stop during second world war and it was never built. Matvey Manizer creates bronze statues to describe the new Socialist order. The statues describe farmers, workers, soldiers, around the Ploshchad Revolyutsii station. The Moscow metro stations in this era believe that “art is useless unless it serves politics’. This art also decorates the ceiling at Mayakovskaya station that describes forming a work known as 24-hour Soviet Sky. Some of the metro stations constructed to be functional during the war. Mayakovskaya metro station serves as a bomb shelter during the second world war. The Russian filled the halls of these metro stations during the ‘great patriotic war’. The Komsomolskaya station in 1952 is a witness of history. Pavel Korin murals based on Stalin speech in November 1941. A time where Salin invoked historical heroes to inspire the Russian people as they struggled under catastrophic war losses. 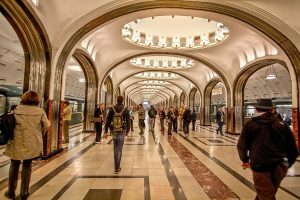 Moscow metro stations luxury station turn to more practical after Stalin’s death in 1953. The new leader prefers a more simple atmosphere through the metro stations. In the certain station, they even removed some of the chandeliers and lavish ornament. The government constructs newer construction with the slogan: ‘Kilometres at the expense of architecture’. They build longer tracks with more lines. The Tverskaya metro station was opened in 1979 with the retro style of the 60s and 70s. Many stations from this period look almost identical. The more recent Moscow metro station after the Soviet Union fall return back to the Stalin style. One of the first metros with this tyle is Rimskaya station. The government chooses Rimskaya name after the Italian capital. In addition, it describes Romulus and Remus sculpture as a symbol of something build after the Roman collapse. Another clue of the Stalin style is a mosaic in Park Pobedy (Victory Park) station that portrays of the great patriotic war in 1945. The Moscow metro stations systems expanding fast. They built more sophisticated and modern stations. Among the very latest metro is Myakinino station. It displays a sleek style. Russia also works together with other parties such as opening up to a public-private partnership. These moves describe the new Russia that is more open to other countries and to changes in their country. Russian government opening more stations to accommodate more Russian and tour around the world. Until now Russian has established over than 175th stations. Russian history lies among the metro stations walls and also in the memory of their people. Whatever they portray among their walls is a true art that describes the Russian journey. You can go from stations to stations and get the Russian athmosphere from long ago until now.